Adopted in 2015, the United Nations Sustainable Development Goals (SDGs) put forth a roadmap for addressing the world’s most pressing social, environmental and economic challenges by 2030. Unlike their predecessors, the Millennium Development Goals (MDGs), the SDGs explicitly call on business to play a role in tackling global challenges like access to energy and clean water. As such, several of the goals specifically target industry and the role they have to play in building a more sustainable and equitable world. SDG9 (Industry, Innovation and Infrastructure), for example, calls on stakeholders in the public and private sectors to build more resilient infrastructure, promote inclusive and sustainable industrialization, and foster innovation for a brighter future. SDG9 may prove particularly relevant for industries already in flux, such as the energy and infrastructure sectors. As the renewable energy market continues to grow, innovation in these industries has become a key to growth now and for the future. Saipem has in its portfolio a series of innovation projects poised to modify its way to work—which record an increased attitude to collaboration, a different way to shape its supply chain, and role changes due to new business models. But what does innovation look like in one of the most established industries in the world? Saipem is a world leader in engineering and drilling activities and in the development of major projects in the energy and infrastructures sectors. The company is adept at operations in harsh environments and remote areas, such as the deep ocean, and it strives to remain forward-thinking on the technological front. At least 70 percent of Saipem’s research and development budget is devoted to what Dr. Marchionna calls “radical solutions” or to fields outside of the traditional oil and gas market. For example, in 2017 Saipem successfully installed the first floating wind farm in the world, the Hywind Scotland Project. The company devised a new process to lift, handle, and install 6 megawatts of wind turbines on floating spars anchored to the seabed—making use of its core competencies for operating in all environments. Saipem and its subsidiaries are now developing more solutions for the offshore floating wind segment, as well as a floating solar park concept. Along with advanced wind farms, Saipem invests in innovation opportunities in emerging marine technologies, such as wave and tidal power, along with energy storage and renewable hydrogen. The company is also looking to reinforce its presence in non-energy related markets such as infrastructures for sustainable mobility, water pipelines and environmental services. Meanwhile, the company is taking steps to increase the efficiency and sustainability of its existing operations within the oil and gas sector, by exploitation of natural gas and by managing the overall CO2 value chain. As the company invests in technology and operational improvements, Saipem is also taking steps to infuse innovation into its overall company culture—and this may prove to be the most lucrative investment of all. The following three examples illustrate how Saipem creates space for an inspired workforce to design technical solutions that can move the needle forward on the speed and quality of the company’s work. Saipem launched the Innovation Factory in 2016. This idea incubator and fast-prototyping lab aims to tackle problems holistically and develop ground-breaking responses to challenges in the oil and gas sector. Through the Innovation Factory, Saipem team members convene for design thinking sessions in a physical and digital space, where they discuss solutions to the pressing challenges identified by the company’s top management. The cross-functional team—selected from within the company according to their propensity for lateral thinking, creative problem-solving, entrepreneurship and collaboration skills—then presents their ideas to the group in the form of storytelling. This physical and cyber network environment stands in contrast to the traditional office. It engages team members at all levels of the company in innovation and problem-solving, while assessing potential prototypes quickly and efficiently. “The key to success is the human factor of in-house innovative thinkers and the external ecosystem,” Dr. Marchionna added. With its Innovation Trophy, Saipem seeks to reward employees who have made their marks by bringing their innovative spirit, advantages and concrete results to the company. Since its inception in 2003, attention was mostly directed toward technology developments. “And, a few of them have laid out Saipem’s most important successes in the recent past,” Dr. Marchionna told 3p. In keeping with the company’s new innovation strategy, the scope of this employee engagement award has expanded in recent years to include process innovations, such as changes in workflow, work tools and management practices. In 2015, the company also introduced a special award to acknowledge the sustainability value of its operations. Saipem hosted its first Innovation and Technology Days in 2017. The company opened the doors to one of its technological hubs in Marghera, near Venice, Italy, to representatives of the media and financial community to present new projects and technologies for the oil and gas sector. This event further signified the creation of company value through innovation. “Other Technology Days were held in 2018 in Cartagena, Spain, about our offshore wind capabilities, and in Algeria, mostly related to our distinguished know-how in LNG [liquified natural gas] technology,” Dr. Marchionna said. In the oil and gas sector, the focus on innovation not only helps companies like Saipem contribute to the global sustainable development agenda under SDG9, but it also allows them to maintain a competitive advantage and remain relevant in a rapidly changing world. For its part, Saipem continues to seek out cutting-edge ways to bring projects to fruition. 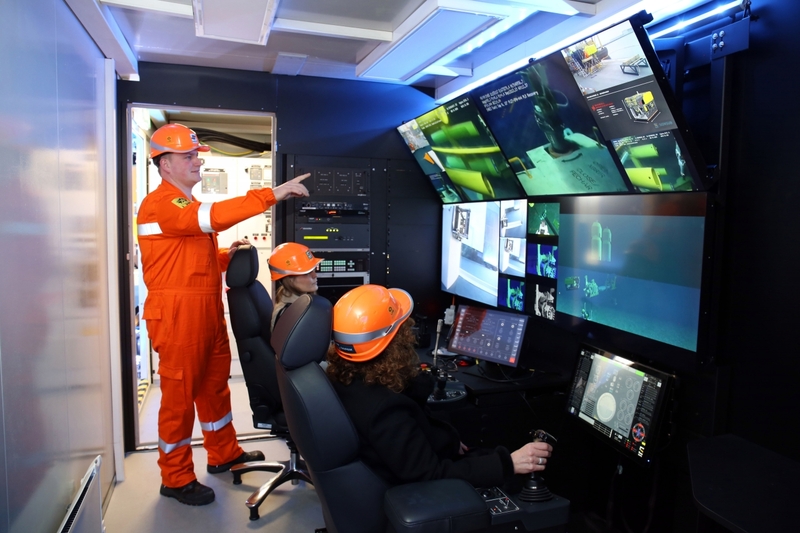 “By scouting out new technologies within and outside of the oil and gas industry, we are able to identify disruptive emerging technologies as opportunities that could have a high impact on Saipem’s business,” Dr. Marchionna said.